Yesterday I came back from Belgium and bought few packages that I haven't seen in the Netherlands before. I first saw advertisement of this new Coca Cola drink on few poster and so I went to the supermarkets to buy it. On the can it says it contains healthy vitamins and that's what the plus stands for. I really do like the graphics on this can, it's a kind of aboriginal design. Also it is actually not the normal can size that Coca Cola normally uses. It's a sleek can that fits 0,33L of Cola in it. The silver of the can is actually not the color of the can it self but its a silver paint. Now for the taste, it actually doesn't taste bad but it actually taste almost like nothing. 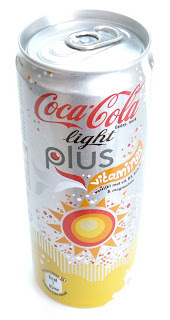 It have a very light coke taste, but might be me because I never drink Coca Cola light. However it's easy to drink and not like you need to take small sips but you can drink it easy with big sips of it.